SS Nujoma is a first of its kind diamond exploration and sampling vessel built by Kleven Verft. Image courtesy of Marin Teknikk AS. SS Nujoma was launched at Kleven Verft’s shipyard in Ulsteinvik, Norway, in January 2016. Image courtesy of Marin Teknikk AS. A close view of the bow section of SS Nujoma diamond exploration and sampling vessel. Image courtesy of Marin Teknikk AS. SS Nujoma was delivered to Debmarine in June 2016. Image courtesy of Marin Teknikk AS. 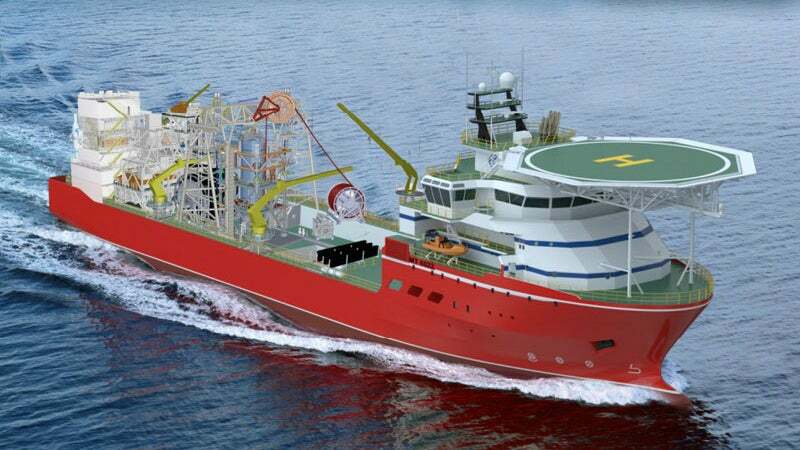 SS Nujoma is a new deepwater diamond exploration and sampling vessel built by Kleven Verft shipbuilding group for Debmarine Namibia, a joint venture of the Government of the Republic of Namibia and De Beers. Debmarine Namibia announced an initial order to construct the vessel in October 2014, and the £100m shipbuilding contract was finalised April 2015. Standard Bank Namibia and RMB Namibia are funding approximately 75% of the project cost. In mid-2015, construction began on the SS Nujoma at Kleven Verft’s shipyard in Ulsteinvik, Norway, and the vessel was floated out in January 2016. It was delivered to the owner in June 2016 for key equipment installation. Final commissioning is scheduled for the first half of 2017. The new vessel will complement Debmarine’s existing vessels, including Debmar Atlantic, Debmar Pacific, Gariep, Grand Banks and Mafuta. It is expected to conduct exploration missions for a period of three years before docking in port for scheduled overhaul and maintenance services. The SS Nujoma is based on Marin Teknikk’s MT 6022 design, which was developed primarily for offshore construction operations. The base design has been modified to accommodate customer-specific equipment for mineral exploration missions. The external dimensions of the vessel are similar to those of earlier MT 6022 designs, while its internal layout varies, based on the specialised systems housed by the ship. The overall length between the vessel’s perpendiculars are 112.8m and 105.65m respectively. The moulded width is 22m and depth to main deck is 9m. The vessel has a displacement of 12,000t. The vessel features a helicopter deck on top of its bow deck. The helideck is suitable for the operations of a medium-lift helicopter such as Sikorsky S61. The on-board helicopter allows operators to transfer crew and valuable products from the ship. The SS Nujoma will be equipped with a subsea sampling system and treatment plant developed by De Beers Marine South Africa. Installation will be performed in the Port of Cape Town in late 2016. The vessel will also be fitted with a large drilling system capable of collecting 48 seabed samples a day. The process plant aboard the ship will employ screening, scrubbing and other methods to upgrade the product. Resource mapping will be performed using a side scan sonar, chirp sub bottom and airgun profilers, multi-beam echo-sounders, and autonomous underwater vehicles (AUVs). The vessel will support mining operations on the ocean floor at water depths between 90m and 150m. "The advanced equipment and systems fitted on the SS Nujoma will allow it to carry out tracking, positioning and surveying operations." The on-board navigation and communication equipment includes a satellite navigator, an electronic chart display and information system (ECDIS), a compass, autopilot and radar systems, a speed log, an automatic identification system (AIS), a voyage data recorder (VDR), radio equipment, helicopter beacon and monitoring solutions. The advanced equipment and systems fitted on the SS Nujoma will allow it to carry out tracking, positioning and surveying operations. The vessel will offer accommodation for 80 crew members in single and double cabins. It will also feature a reception area, a hospital, a galley and a gymnasium, as well as mess, office and conference rooms. The diesel-electric propulsion system of the SS Nujoma integrates Caterpillar diesel engines and generator sets, as well as Rolls Royce thrusters. The vessel is also equipped with an emergency generator set to supply power for shipboard systems.